Hi all, looking for a serious answer here. I Have been playing with a 2.5w arctic spyder 3 on high power mode looking directly at the dot and beam everyday for 2 months now at very close distances off of various surfaces without the safety glasses and have no noticeable eye damage and even had a full eye exam (oct retinal exam included) at an optometrist with no issues whatsoever. Does anyone have an explanation? I need an answer thank you. I am being entirely honest I now realise how extremely stupid and careless I was coupled with the fact that i didn't do adequate research on laser safety, i have now sold the laser. I cannot stress enough that I am being honest, from this experience I now know a lot of what is being said is bull for example, i think the general consensus that looking at the dot of a laser over 50w can cause damage is false. I think you've been extremely lucky, and have not taken an actual beam hit to your eye, you've probably been looking at the dot as it is reflected off of nearby surfaces. Looking directly at a 2.5W laser would blind you in less time than you could blink. You sound like an accident waiting to happen, and without proper eyewear, you will eventually do great damage to your eyes. 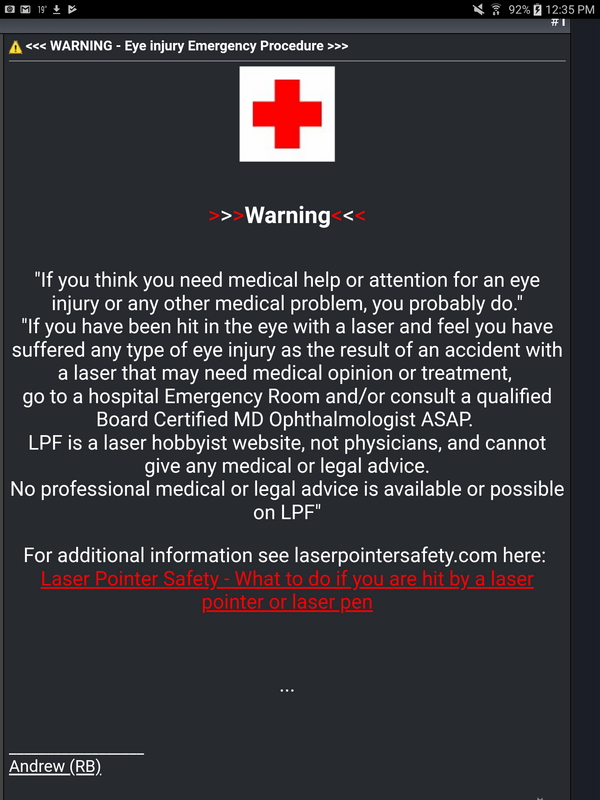 The following warning may not totally apply as you've been to an optometrist, but the bottom half holds true, please visit "Laserpointersafety.com", and use proper safety eyewear. The answer is you need to get you head examined--Please do not troll this forum with your BS. hellava first post.. no welcomes from me. IDIOT! 'No Welcomes for YOU! " The OP post makes no sense common or otherwise. Total train-wreck of a post. If you're actually telling the truth - you've been lucky to not have suffered a direct beam hit, or specular reflection (off a shiny surface). Reflections from matte surfaces are relatively safe - but the reason we wear safety goggles is in case of accident. Of course we're not going to look at a direct beam even with goggles - but if you were handling a laser and dropped it, the beam reflecting off a glass window into your eyes for example - that would be catastrophic. Don't be a moron. Wear your damn goggles before you irreversibly blind yourself. 'No Welcomes for YOU!View attachment 63210"